In Japan, New Years means a big traditional meal with relatives! In Japan, お正月 (New Years) is the biggest holiday. It can be compared to クリスマス is Western countries because stores and houses are decorated, families get together for a large traditional dinner, kids get gifts, cards are sent, and many shops are closed for the holiday (although nowadays most stores stay open). There’s alot to お正月 (Japanese New Years), so I hope I can explain it clearly. Until about two-hundred years ago, Japan followed the Chinese year with New Years in early Spring, but now follows the Western calendar with New Years Day on January 1. But the Chinese zodiac is still used with each year being represented by an animal. There are twelve animals (well, actually eleven animals and a dragon 😉 )…2008 is the “Year Of The Mouse” and 2009 will be the “Year Of The Cow”. In late-December, many people go out drinking with friends or co-workers for a 忘年会 (End-Of The-Year Party), (or they may go out with them in January for a 新年会 (New Year Party) instead). 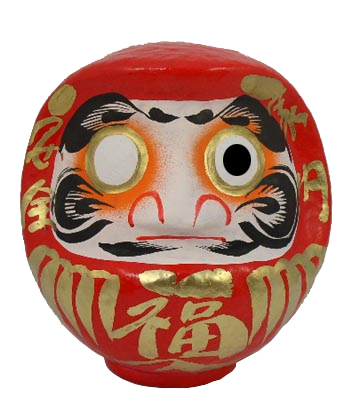 In December, people clean their houses from top to bottom (similar to “Spring Cleaning” in the West) and they may decorate their house with traditional Japanese New Years decorations such as 鏡餅 (kagami-mochi), 門松 (kado-matsu), おかざり (okazari), and ダルマ (daruma). Also in December, people write and send out 年賀状 (New Years Postcards), which are kinda similar to Xmas cards in Western countries. 年賀状 (New Years Postcards) are written by hand on special New Years postcards that can be purchased from the post office or some other stores. Many people buy blank postcards and draw their own picture on it that usually incorporates the new years Chinese zodiac animal and some New Years greeting, or they buy postcards with New Years pictures and greetings on them, or nowadays it’s become popular to print them on the computer (Japanese Microsoft Office Word® software on Windows® comes with a function to design 年賀状 (New Years Postcards)), or another option many people use is to have a photo studio make their 年賀状 (New Years Postcards) with a family photo (usually if there was a major event that year in their family, such as their kid’s 7-5-3 Festival). Regardless of how they make their 年賀状 (New Years Postcards), a personal message to the addressee is handwritten on each one. If 年賀状 (New Years Postcards) are put in the mailbox during dates specified by the post office, they are guaranteed to be delivered on January 1 exactly. Also, each 年賀状 (New Years Postcard) has it’s own serial number printed on the back. In January, the post office announces a series randomly drawn numbers for a New Years Postal Lottery…whoever has a postcard with a winning number can receive a prize which is often something like a paid vacation in Hawaii, a television, a stationary set or stamps. (I have never won anything yet, except stamps). Then on New Years Eve, people might watch one of the popular music theme shows on television or they may pay a visit to a temple for the temple priest’s ringing of the temple bell 108 times…which is a Buddhist tradition. On New Years Day, firsts are important. The first meal of the New Year should be 年越そば (New Year’s noodles), many people watch the year’s first sunrise, the first dream of the year is important, as well as the first calligraphy, first tea ceremony, etc. Just like Xmas in the West, families get together on New Years Day for have a traditional Japanese お正月 (New Years) dinner called お節料理 (O-sechi-ryouri). Children are given お年玉 (gifts of money in special envelopes). These envelopes are usually decorated with popular cartoon characters…so, often, when the kids are little, the envelopes are more appealing to them than the money inside! And playing お正月 (New Years) games like かるた (Karuta) or 福笑い (Fukuwarai) is popular. Finally, on New Years Day and for a few days following, stores often have big sales…so shopping is popular (especially with young women). Many stores also have 福袋…which is often translated as “Happy Bag” or “Lucky Bag“. These are bags of various items from the store put inside a sealed bag and sold at a discount. The only catch is…you can’t look inside the bag until you pay for it (the stores tell if whether the items are for men, women or children and what the sizes are (if there are clothes inside)). お正月 (New Years) is also one of the two times a year that the public is allowed inside the Imperial Palace grounds to hear the Japanese Emperor’s New Year’s greeting. So, お正月 (New Years) is a busy time…but it’s also fun.